Here is some great, basic water heater info. The water heater is an essential part of your home. What would we all do without a nice, hot shower at the beginning or end of our day? Here’s some basic water heater info so that you can better understand this vital piece of your indoor plumbing. Before the invention of water heaters, many people would bathe with cold water, and use perfume and cologne in lieu of actually cleaning themselves to avoid these awful baths. The more ambitious people would heat water on a stovetop to keep in warm. Well hot baths became much easier in the 1870s when Englishman Benjamin Waddy Maughan invented the first instant water heater. Little is known about Maughan’s invention, however, his invention influenced the work of Edwin Ruud. 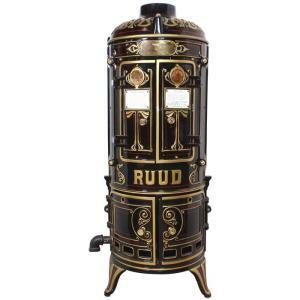 The Ruud water heater is a water heater that is common today. 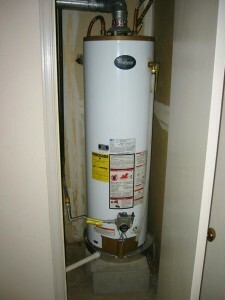 A water heater typically looks like big metal cylinder, tall drums that are often consigned to a laundry room or basement. Newer styles have some interesting features, like losing the tank completely in favor of water-on-demand, but the old, reliable water heater design that’s most widely used in the U.S. today is really a pretty simple appliance; it’s basically a drum filled with water and equipped with a heating mechanism on the bottom or inside. A water heater thermostat controls the temperature of the water inside the tank. Normally, you can set the temperature anywhere between 120 and 180 degrees Fahrenheit (49 to 82 degrees Celsius). The water temperature setting recommended by most manufacturers is between 120 to 140 degrees Fahrenheit (49 to 60 degrees Celsius). This is hot enough to be efficient for household use, but not so hot that it could pose a scalding risk. There are many different types of water heaters. There is a conventional tank heater that always stores heated water, always ready for use. Also there are tankless water heaters that heat up the cold water as it passes through the heater. Then there are hybrid heaters that heat water with an electricly powered pump, which will also reduce heat in the air itself. There are a lot of different factors that go into choosing the right one for you. Always make sure you confer with a plumbing professional about which type of heater is best for you. And that’s the skinny on your water heater info. It’s a very convenient tool that keeps you from having to boil a pot of water every time you want to take a shower. Take good care of it and it will take good care of you. Always call a professional plumber to come and install your water heater correctly!